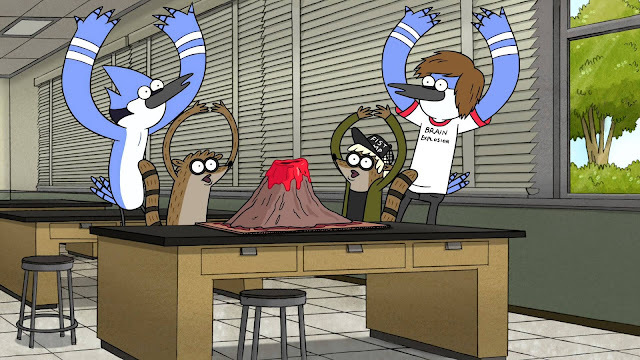 Regular Show - as all the "cool kids" and "cool adults with kids" know - is the most innovative and down-right hilarious children's program on television right now. Or, more accurately, ever. The Mighty Boosh-inspired animated series sees our protagonists in an array of outlandish and surreal situations, engaging in battles with unicorn frat bros, malicious cassette apparitions and even death himself. Even more peculiarly, the rag-tag collection of heroes who star in J.G. Quintel's creation include the likes of a giant blue jay, a raccoon, a gum-ball machine, an immortal yeti and an over-weight green slob named "Muscle Man". To say its not the most straight-forward of worlds is an understatement. 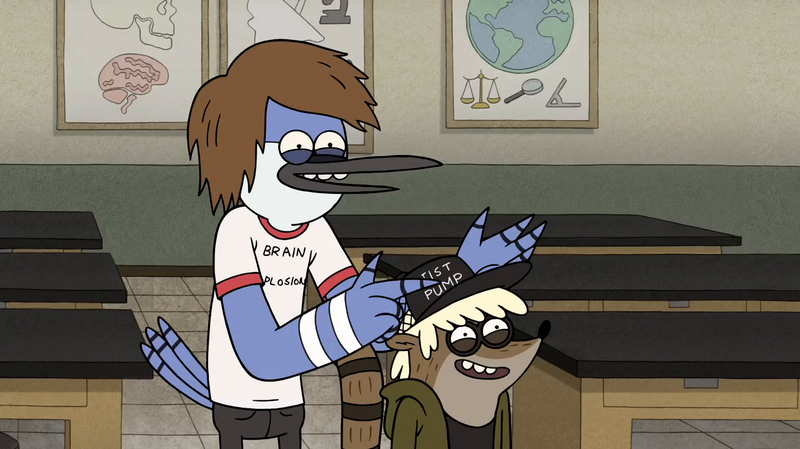 Unexpectedly, however, Regular Show also consistently features some of the most insightful and accurate portrayals of inter-male relationships ever seen on TV; the series' depictions of friendship, and the meaning of platonic love, are frankly astounding in their perceptiveness. As to be expected with a movie length extension of the show, these aspects of Regular Show are only amplified here. It'd take a rare soul to not need to stoically fight back a tear or two during an emotional climax in which the future of the whole world and a best friendship are both at stake. As in real life, the two things often feel remarkably similar. As the running time has been extended from the regular ten minutes length of the show's individual episodes, so to has the scope in J.G. Quintel's movie - here we see our protagonists, Mordecai and Rigby, travel through time and space; their main journey, of course though, is that in their hearts. The film opens in the distant future - a time of space ships and laser wars. Indeed, we meet a future version of Rigby as he leads a crew into a shoot-out against an evil cyborg named Mr. Ross who is hell bent on destroying the universe. Rigby is foiled from defeating his foe by an entity revealed to be his former best-friend Mordecai - what has gone between the pair that has put them on the opposite ends of an inter-galactic war? We learn, quickly, that a wedge has been drawn between the two by a fool-hardy act of love gone wrong. With time-travel capabilities to put things right, will Rigby find the maturity to apologise to the friend he wronged in the past? Or will his stubbornness result in the end of all life as we know it? Over seventy minutes of a science fiction action comedy, Regular Show: The Movie intelligently recalls the likes of Back to the Future and the Bill and Ted films. Yet, more than this, it is a feature which forensically examines friendship and the unspoken feelings shared between friends. In The Princess Bride, another remarkable film about love, Peter Falk famously says "As You Wish" when he means "I love you". Here, the characters, restricted by macho codes, can't quite bring themselves to say what they mean either. Yet, as they offer each other a muffled "Hmph-hmph-hmph", we know the words their mouths can't articulate.